The designers behind a new web-based app want to do for planning what GarageBand has done for basement drummers. Streetmix was developed this year by three Fellows at Code for America during a 7-hour hackathon. According to the CFA website, the coders behind Streetmix aim for the app to grow awareness around the national Complete Streets initiative. 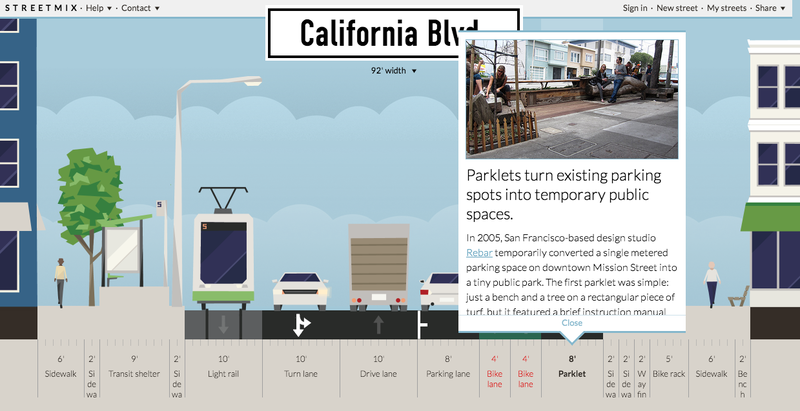 Launched in beta just over a month ago, the app lets users select elements from a toolbar of basic street design features, including drive lanes, bike lanes, planted medians, bus shelters, and even parklets. Pop-ups provide more info about bike lanes and parklets, even linking to the NACTO Urban Bikeway Design Guide. This is not Illustrator or even SimCity— the choices are extremely basic— but it’s surprising how quickly and expressively a 2D streetscape can be transformed with the addition of a few plantings and a bench or two. On a test run, I got a little carried away with all the features I wanted to include in my street. By the time I doubled my bike lane to go both directions, added a parklet and sidewalk section for bike racks, and widened the median planting strip, I was being alerted that my street had exceeded its predetermined width. I decided to nix the planting strip, but not the bike racks; finally, I ended up widening my street by about 20 feet anyway. If only it were so easy! While not exactly cutting edge in form or functionality, the app clearly has enormous potential as an aid in public charrettes— in part because of its simplicity. Not only does Streetmix eliminate the need for an all-too-familiar arts-and-crafts-style visioning session, but it gets closer to depicting what a street might actually feel like with, say, an elevated transit shelter. In the long run, however, what seems most meaningful about Streetmix is its ability to convey the details involved in urban planning, and also the possibilities. When members of the public understand the individual components that make up a street and the ways in which those basic elements can be organized to significantly impact its safety and sustainability, they can become more informed, invested and capable. Fingers crossed for an “intersections” plug-in. Check out apps and more from Code for America here.